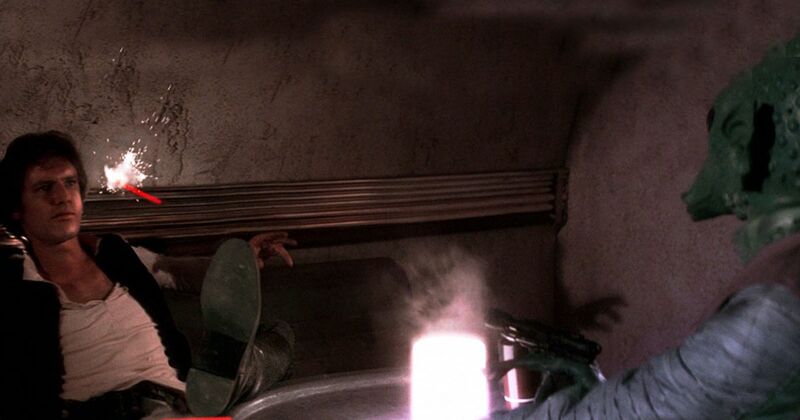 Will We See Han Fire First In Blu-Ray? Updated March 3rd 2017: Nope. Update: Disney’s Director of Library Restoration and Preservation Theo Gluck confirmed that the Star Wars 4K edition they are working with is the most recent revision (i.e. special edition). Gluck was speaking at Ohio State University’s Wexner Center for the Arts, a presentation called Animation Restoration at Walt Disney Studios. However, 20th Century Fox’s Senior Vice President of Library and Technical Services, Shawn Belston (who was also on-hand at the event), added that the original “trims” removed from the OT negatives do still exist, which means that the original, pre-Special Edition cuts of the original Star Wars trilogy still could be assembled, should the powers-that-be decide they want to release them. Truthfully, I would not anticipate that happening. Rumors about the original unaltered trilogy being released on Blu-Ray is nothing new. These rumors have been circulating since Disney purchased Lucasfilm in 2012, but the intensity of these rumors have begun to swirl around more and more as we approach the 40th anniversary of the original Star Wars. Aside from Greedo firing first (and completely missing Han from literally across the table), I do not mind the re-release cuts. I enjoyed seeing the dialogue between Luke and Biggs prior to attacking the Death Star. The scene between Han and Jabba was a little wonky, but helped set up the history between the two characters that played out later in the trilogy. I know my wife preferred the original dancing Ewok Yub Nub song at the end of Return of the Jedi. I do not believe the inclusion or exclusion of any of these scenes effects the new ‘canon’ of the movies in any way (unless they re-include the Sebastian Shaw/Anakin ghost) . I do not foresee Disney having any issue with further cashing in on these films with minimal new investment cost. I will keep you posted as I hear new details.